VATICAN CITY (CNS) — Delegations from the Vatican and from Vietnam reported continued progress in discussions between their two countries, a Vatican press statement said. “The two sides agreed to maintain constructive dialogue, in a spirit of goodwill with a view to increasing mutual understanding and further promoting relations between the two sides,” said the statement, released Oct. 26. The two official delegations met at the Vatican Oct. 24-26 for the sixth meeting of the Vietnam-Holy See joint working group. The last working group meeting was in Hanoi in 2014. While the two countries do not have full diplomatic relations, Vietnam’s agreement to let the Vatican name a non-resident papal representative to the country in 2011 was seen as a major step in an ongoing process to normalize relations. The appointment came after landmark high-level meetings such as Pope Benedict XVI’s meeting with Vietnamese President Nguyen Minh Triet in 2009 and his 2007 meeting with Prime Minister Nguyen Tan Dung. That meeting marked the first time a prime minister from Vietnam’s communist government met a pope and top officials from the Vatican Secretariat of State. 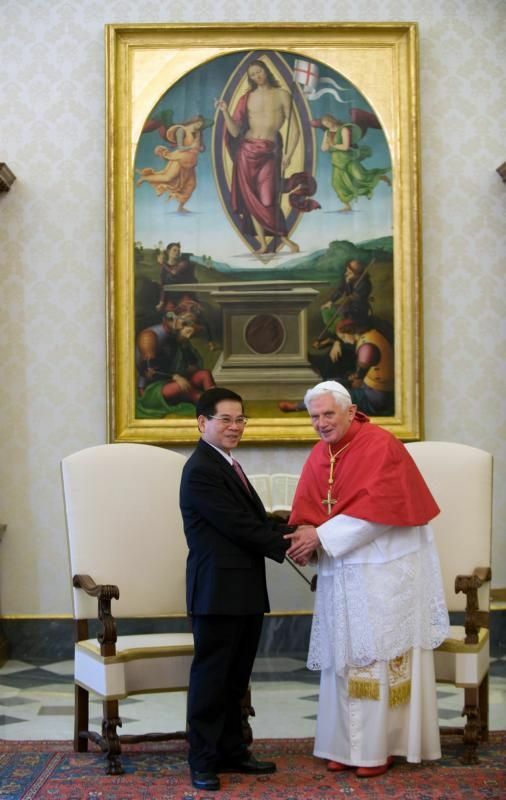 Talks and relations between the Vatican and Vietnam were strengthened further when Pope Benedict met the head of Vietnam’s communist party, Nguyen Phu Trong, and top party and government officials in January 2013; it was the first time a pope had met with the general secretary of the nation’s Communist Party. The Vietnamese delegation, it said, reiterated Vietnam’s “consistent and practical improvement of the legal framework and policies on the promotion and protection of people’s freedom of belief and religion” as well as the country’s “encouragement and continued facilitation of the active engagement of the Catholic Church in Vietnam” in promoting socioeconomic development in the nation.